Whether you’re a seasoned baker or a beginner, this caramel pie will satisfy holiday dinner guests, guaranteed! Fair warning: this pie is not diet friendly. Now that Thanksgiving is in the rear view mirror, it’s time to focus on what to put on the table for Hanukkah or Christmas dinner. If you’re the sort of person who asks for more caramel sauce on your desserts, you’re going to love this caramel pie! There isn’t really anything in particular about this pie that screams holiday, but it’s so over the top, indulgent that I can’t think of a more appropriate time to serve this pie than around the holidays. This isn’t the dessert that’s going to be the center piece on your dessert table, but I promise you that it’ll be the first one devoured. Don't be alarmed by the cook time; it's easy and you don't need to be in the kitchen the whole time. For once, I am 98% done with my holiday shopping and it’s not even December yet! My husband has been bitten by the Clark Oswald bug and has gone absolutely insane with Christmas decorations outside of our house that I’m sure whether I should be impressed or concerned. I’m going to say I’m impressed because it’s made life so much easier on me this year, as in the past, he’s thrown out the “I’m Jewish” card and does as little as possible to help out. Does your significant other help out when it comes to decorating or organizing things in general when it comes to the holidays? Since my dad and I are going to New York for Christmas (cross your fingers this California girl doesn’t freeze to death), I’ve been baking all sorts of Christmas desserts since before Thanksgiving. I think baking lots of treats and giving them away is my favorite part of the holidays and I want to make sure my friends and family have their fill of indulgent treats while I’m away. Anyhow, back to the easiest salted caramel pie recipe ever created. 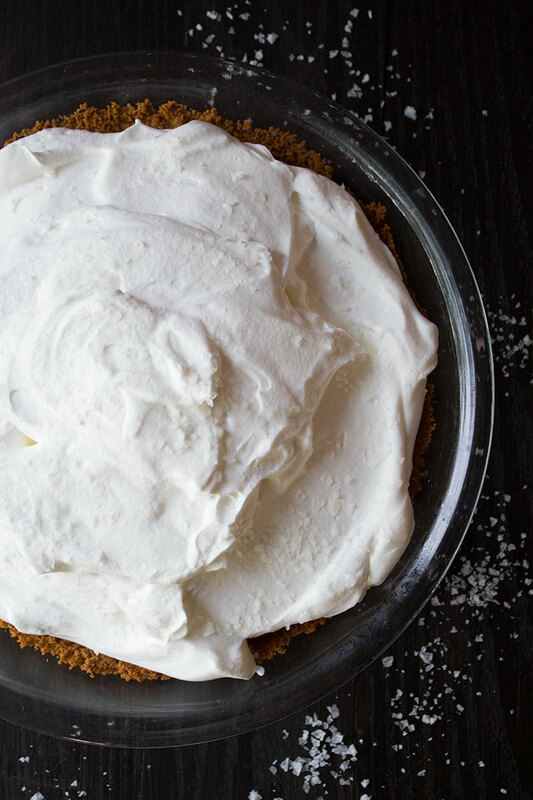 In all seriousness, this pie is made in three basic steps: the super simple brown sugar-graham cracker crust gets baked, some sweetened condensed milk is cooked in the oven with a pinch of flakey sea salt until it’s changed in color and texture, and a healthy dollop of whipped cream on top of the pie. It can easily be made in one day, or, if you aren’t going to serve it right away, make the crust and the filling several days in advanced (just store them separately), and put it together several hours prior to when you plan to serve it. If you’re asked to bring a dessert to dinner, you can assemble the crust and filling, and take the whipped cream in a separate container and assemble it once you get to your destination. If you want a bit of crunch, or enjoy salty and sweet in one dish, sprinkle some more of that flaky sea salt over the whipped cream for a truly over the top flavor profile in your mouth. This salted caramel pie is simple to make and is every caramel lovers' dream. Preheat oven to 350º. In a food processor, pulse the graham crackers, brown sugar and butter together until the crumbs are evenly moist. Evenly press the crumbs into a 9" pie pan.Bake the crust until lightly browned, about 10 minutes. Remove from oven and cool completely.Pour all the sweetened condensed milk into a baking dish, sprinkle with flakey sea salt. Place in the preheated oven on a cookie sheet, and add enough water to the cookie sheet to cover 1/4 of the side of the baking dish. Cover the sweetened condensed milk with foil and bake for about 3 hours, stirring 2 or 3 times until the mixture has thickened and resembles caramel. Add more water to the cookie sheet as needed. Fill the pie crust with the filling, smoothing out the top as best you can. The lumps will go away once the mixture cools. Cover the pie with a sheet of greased plastic wrap for at least 2 hours. In the bowl of a stand mixer, whip the heavy cream with the confectioners' sugar until stiff peaks form. Dollop the whipped cream over the top of the pie, along with a generous pinch of more flakey sea salt. Cut into wedges and serve. Other than baking this salted caramel pie, what are your plans for the holidays? Are you going anywhere special?